In one of bumbling cartoon father Homer Simpson's humorously ineffective attempts to please his children, he hands his son Bart a pen to click as an alternative to annoying his sister Lisa by purposely squeaking his chair. Of course, the clicking only makes things worse, but the coup de grace is when Homer proclaims, "Hey, that looks like fun!" and, taking another pen from his pocket, challenges Bart to a race. Click click click click click. Welcome to 16 Shot! Shooting Watch, in which you too can experience the joy of rapid tapping. Finally, Americans can try out the type of basically useless application that Europe has been blessed with, seeing such memorable titles as Flashlight and Discolight. To be fair, a few may be able to eke some worth out of this outmoded utility. It's a virtual version of a tool originally released by Hudson in 1987 to count the amount of times that one could press a button in ten seconds. If you're completely baffled, think of what games people would have enjoyed at the time; quite a few, such as Star Soldier and Space Invaders, required the player to click as quickly as possible. 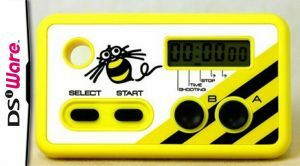 While many still enjoy the genre, the most popular method of obtaining a high score no longer involves spending a quarter for each try. Making title-earning a less expensive affair might have been one reason to invest in this, but of course that no longer applies. It's debatable whether just playing an actual game would be a more or less effective option, but it would undoubtedly be a lot more fun. Is this program beginning to sound obsolete? It certainly feels that way. The straight-out-of-1987 interface features a digital counter and clock on the top screen and a graph below that charts how well you're doing per second and in total. You can choose to tap A or to alternate between A and B for either ten or five seconds (sprint mode!). Afterwards you're ranked in a list of the top four high scores and can sign your name with the stylus. 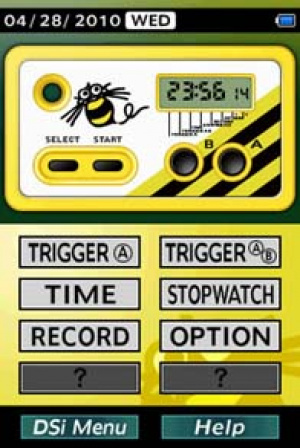 There's also a stopwatch and, for those with the patience to unlock it, a slot machine simulator. It's all presented in a quite bare-bones fashion, without anything really added to the simple experience you would have had with the original machine. This style is perfectly fitting for 16 Shot because it's too niche for anyone who hasn't heard of it before to appreciate it. Hudson makes no effort to explain the application's purpose or even what "16 Shot" means, something that you might be wondering yourself by now. It refers to Takahashi Meijin, a.k.a. Master Higgins, who set the record of sixteen button presses in one second and went on to spiritually star in Adventure Island. Here he'll hold the top spot on the appropriate high score list as a constant reminder of your own limitations. For those to whom attaining fame at Twin Galaxies, the local arcade, among your siblings or in your own deluded head is worth the trouble of using such an application, then, this might be useful. A cursory search of YouTube reveals that there are still those out there who find the original device to be quite cool and even practical. Over twenty years after Shooting Watch's debut, however, we at Nintendo Life ask for more than a tap counter to satisfy our score improvement needs. Surely with the technology of today, Hudson could think up a more entertaining way to help us improve our arcade efficacy. There's not even any technique to this, only a trial and error test of tapping styles and a simplistic drill in finger fitness. Clearly, the goal here is not to provide for contemporary audiences what the original Shooting Watch did for that of yesteryear but instead to give a handful of master blasters a nostalgic kick. Only this, and nothing more. 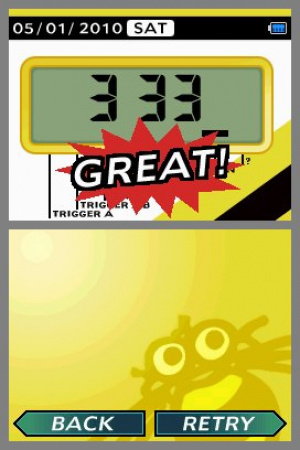 This is an obsolete high-score improvement tool good for little more than nostalgia. Hudson utilises none of the advantages of today's technology to make 16 Shot attractive or applicable to current gamers or to improve on the original design of twenty-three years ago. Besides the slightly redeeming stopwatch function, this program is basically pointless. Had a feeling this was going to be a dud... but watching that guy slam the crap out of the toy the LAST time you guys reported this was amusing enough. Not that there's any chance I'd download this whatsoever, but aren't there supposed to be online leaderboards for this, or did they not even include that? Lol, I can't believe that guy in the youtube video honestly thinks that because he was able to increase his score in a game after using the shooting watch that it was all due to the shooting watch and not just due to learning how to play the game better the second time around. @iphys No, there are only local leaderboards. LOLOL.I wonder how Corbie would respond. Great review, Zach! "...an application, then, this might be useful"
Might want to remove the comma after the "then". @KnucklesSonic8 Thanks for the nice comment and for reading! Actually, though, the second comma is correct. Alright, that sentence just seemed a little awkward to me. Anywho, I thought you did a great job with this, keep it up! Something that rhymes with tap that can be done 16 times a second. If it's free it's worthed but $2 even it is asking to much for just simple button mashing. Coincidentally, there used to be a free version of this online, but it doesn't work anymore. @Rhansley64 It's true! This would be a great inclusion as a free feature of another game, as it seems to have been in Adventure Island: The Beginning, or even as a free download (though the transfer time might cancel out its worth) but as a stand-alone purchase it's just ridiculous. Not a lot of function from this but for $2 and the nostalgia.. who knows? I knew it was gonna get a bad rating, I'm still interested in this though. Maybe I'm better off importing a real Shooting Watch from Japan. Yeah...should have been a free app/feature. I like it and some of you people are bad at pricing. You can find this stuff for $2.00 and yet it doesn't have a high score chart. Wow...looks fun, yet pointless at the same time. might be good for my hyperness. @SepticLemon If you're going to get a Shooting Watch, it might as well be this one. Would have been better if it was for free. While I like its novelty the review is great. I just have to ask how do you unlock the slot machine modes? Nice to see Takahashi Meijin got mentioned, but how about those finger vibrators? Or use a vibrating ruler. I won't get this one. But I think this beats-per-minute measuring device is useful for a quick heartbeat check when exercising. With a little more options, though, it can also be useful as a counter. Imagine if you can count indefinitely. You can count visitors to a park, passengers to a bus, and so on. Makes a dandy ranger beads replacement. In fact, they used to sell such a device, and I saw them being used. Or maybe (with target bpm) just a steady meditation aid device. A simple device, for sure, but it can be much more useful had the design be expanded just a bit. I prefer training my fingers with a typewriter. Best one would be a manual typewriter to train those little pinkies to break watermelon. No review of the slot machine? That could be fun, and may tip other people to spring for this one. Think of it: Portable dice! I think that can be very useful. It's not fair if such a useful feature did not get reviewed, even if you need to unlock it. Who knows? It could bump the score to 3. @bloocheese565 Thanks! To unlock the secret modes, check out Hudson's website for the iPhone version, though you'll have to solve a Sudoku puzzle to figure it out! Speaking of which - this version is only $0.99 and includes an extra bonus mode. Um this seems like something you'd find on the appstore for free. But honestly id rather pay 2$ for a pen to click then this. If it was free maybe id consider it but why would anyone be expected to actually pay for something like this? If you guys want to play this just get out your ds when it's off and hit the buttons! I have played this game for months now and for the record, the buttons are working perfectly. That's what the buttons are made for. + this game gives you the modavation, to beat master higgins. But it's hard. I have the feeling he cheated. Anyone who's into time wasters this is the king of time wasters having 10 second button pushing, Sprint (5 seconds) 3 Slots, and 4 slots. This game is a 6/10 for me. Also why would you pay $2.00 to click a pen when you can get more in this. I absolutely love that I downloaded this. Use it all the time during really small breaks.